Ahed Tamimi, then 16, stands for a hearing in the military court at Ofer military prison on Jan. 1. She accepted a plea bargain and is to be released in July, her lawyer said. A Palestinian teenager who gained international attention after a video showed her slapping and kicking an Israeli soldier has agreed to plead guilty to assault charges and will serve eight months in prison. Ahed Tamimi, 17, became a symbol of Palestinian defiance to military occupation after she confronted Israeli soldiers outside her home in the Israeli-occupied West Bank on Dec. 15. Video of the incident went viral after Tamimi’s mother shared it on Facebook. But many Israelis consider her a provocateur, similar to members of her family who have protested against Israeli policies for years. Tamimi, who was 16 at the time, was later arrested and indicted on 12 charges, including assault of an Israeli soldier, and charges related to other incidents going back to 2016, when she allegedly threw rocks, threatened and assaulted Israeli forces. Both Tamimi and her mother, Nariman Tamimi, have been held in jail for three months, and they will serve an additional five months as part of plea agreements, NPR’s Daniel Estrin reports. 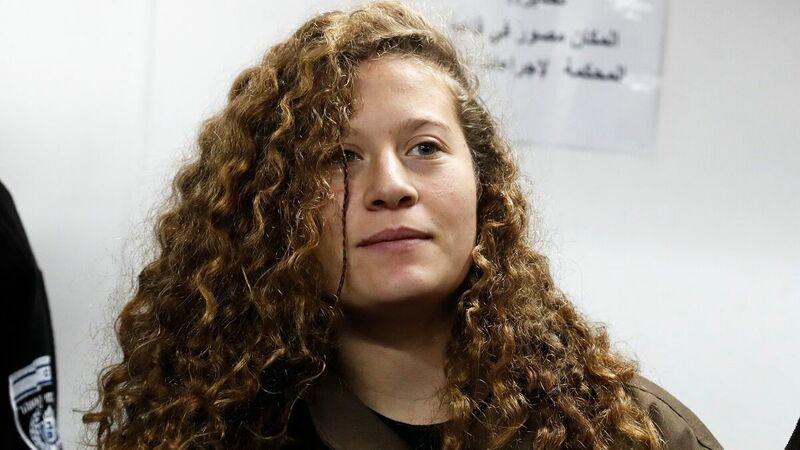 Eight of the 12 charges against Ahed Tamimi were dropped. She pleaded guilty to four charges: assaulting an Israeli soldier and an officer, disrupting a soldier and incitement, Israel’s military said. Nariman Tamimi “was also charged with incitement on social media and assault, while her cousin Nur, who participated in the incident, was charged with assault,” the BBC reports. They both accepted plea deals. Nariman Tamimi was sentenced to eight months and a fine equivalent to about $1,725, while Nur Tamimi was sentenced to time served of 16 days and a fine of about $575, Haaretz reports. Ahed Tamimi, though a teen, will also pay a fine equivalent to about $1,400, her lawyer Gaby Lasky said Wednesday, according to The Associated Press. Her father Bassem Tamimi told the AP that the family agreed to a plea deal because prosecutors had threatened the mother and daughter with three years’ detention. Lasky said the sentence includes time already spent in detention and Tamimi will be released in July. In the video, Israeli soldiers largely avoid reacting to Tamimi besides swatting her hand away. Military prosecutors said her slapping and kicking was assault. Many Israelis say members of Tamimi’s family have exploited her into creating confrontations with Israeli soldiers on video. However, NPR’s Estrin and Merrit Kennedy note: “The altercation with soldiers happened shortly after Tamimi’s cousin was shot in the head with a rubber bullet during a demonstration as he climbed a wall of a complex that Israeli soldiers had commandeered,” according to Bassem Tamimi. The father also told NPR that the confrontation was in part spurred by Ahed seeing relatives being arrested and killed. Human Rights Watch criticized Ahed Tamimi’s pretrial detention, calling it “both a violation of international law and unnecessary.” The organization and Tamimi’s advocates argue that there is a double standard for authorities prosecuting West Bank residents, where Israeli settlers are tried in civilian courts while Palestinians are tried in military courts.